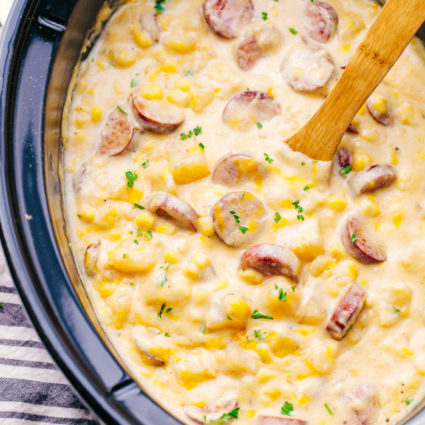 Slow Cooker Creamy Sausage and Potato Soup Recipe is filled with andouille sausage, cubed potatoes, corn, and cheese, the perfect comfort meal for a weekend you can set and forget. If the slow cooker is your thing for fall and winter than you should also try Slow Cooker Beef Tips with Gravy, these beef tips are tender and the gravy is perfect over rice, pasta, or french bread. Easy Crock Pot Mac and Cheese is a huge family favorite that your kids won’t be able to get enough of, and this Slow Cooker Applesauce will compliment any meal or is a delicious snack all on its own. 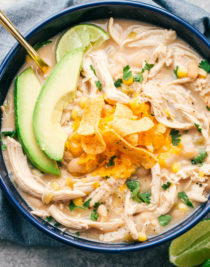 One thing I love about the fall is the excuse to make life easy by making tons of slow cooker recipes. 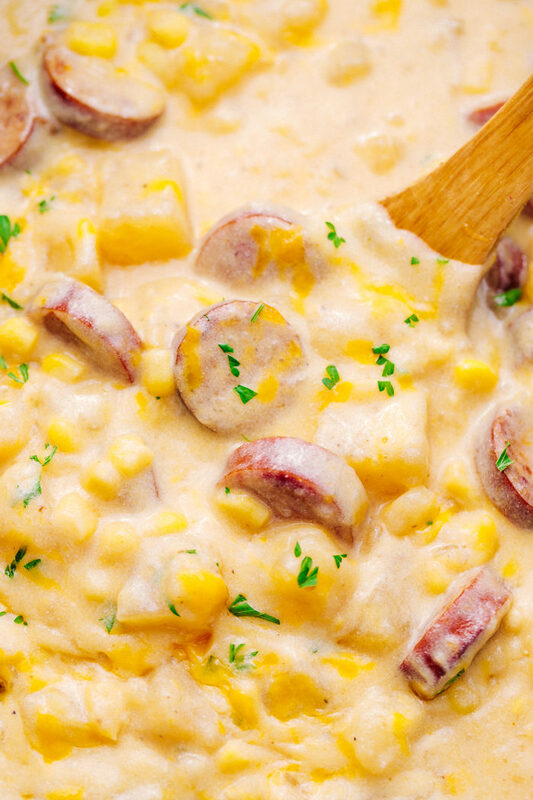 This creamy sausage potato soup is the perfect way to fill you up on a blustery fall day, and is rich and creamy. 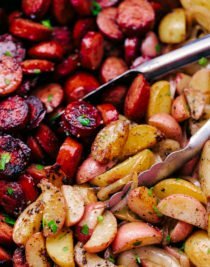 Each bite is loaded with sliced andouille sausage, tender potatoes and cheddar cheese. 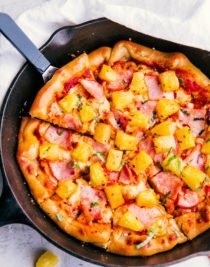 The aroma your kitchen will have while this cooks slowly throughout the day will have your family lining up to grab a bowl when it’s done. 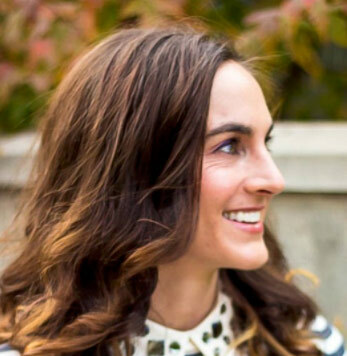 Growing up in Washington state we had our fair share of gloomy days, and cold nights, that’s why I always loved when my Mom would break out the slow cooker, because I new something warm and delicious was going to be waiting for us the next day. This sausage potato soup takes me back to those days and that is why I love to share comfort food recipes with my family and friends, the nostalgia it brings back is priceless. Is it safe to leave a slow cooker on and go out? Yes. Slow cookers/crock pots are safe for cooking long periods of time while sitting on your countertop. They use a very low wattage which allows you to cook with them over an 8-10 hour period of time while not being in the house. How to make sausage potato soup? Using a 6qt slow cooker add cubed potatoes, sliced sausage, vegetable broth, diced onions, minced garlic, onion powder, garlic salt, and garlic pepper. Cover and cook on low for 6 hours. 30 minutes before soup is done, whisk together cornstarch and milk and pour into slow cooker. Cover and finish cooking. Once done, add grated cheese and sour cream. Stir to combine and allow a few minutes for cheese to melt. Garnish with fresh chopped parsley and serve. What are the two basic kinds of soup? There are two basic kinds of soup, thick and clear. Thick soups contain a creamy base such as Crock Pot Cheesy Ham and Potato soup or Broccoli Cheese Soup. Clear soups are made from broths or stocks that are flavored such as this Hamburger Soup or Easy Tuscan Soup. Can you freeze potato sausage soup? Yes. Make sure to let the soup cool and then place in an airtight container or gallon zip lock bag. Be sure to label the container or bag with the name, potato sausage soup, and write the date so you know when you made it. Frozen soup can last between 4 to 6 months if properly stored. 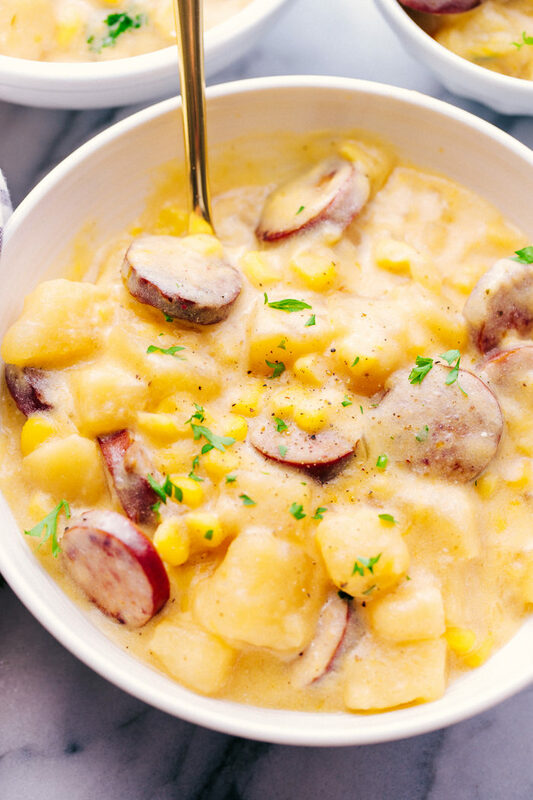 So if you are looking for a creamy based soup that is delicious and will keep well in the freezer, this sausage potato soup recipe is what you need. 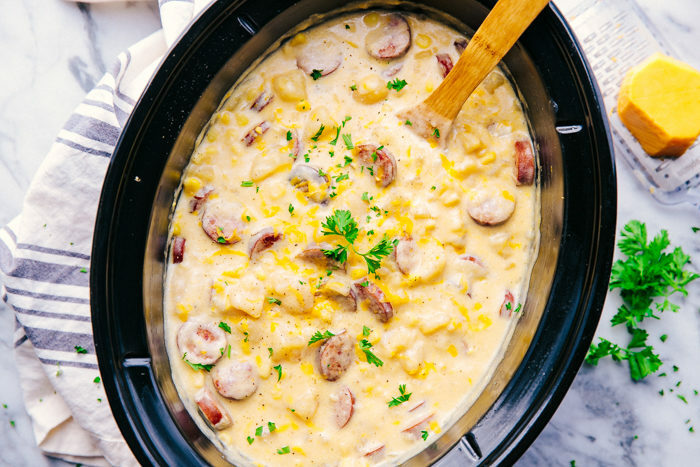 Tis the season to make soup and this Slow Cooker Creamy Sausage Potato Soup Recipe is going to be perfect to warm the soul and fill you up. 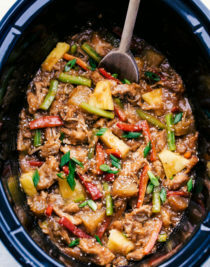 Are you looking for more Slow Cooker recipe ideas? 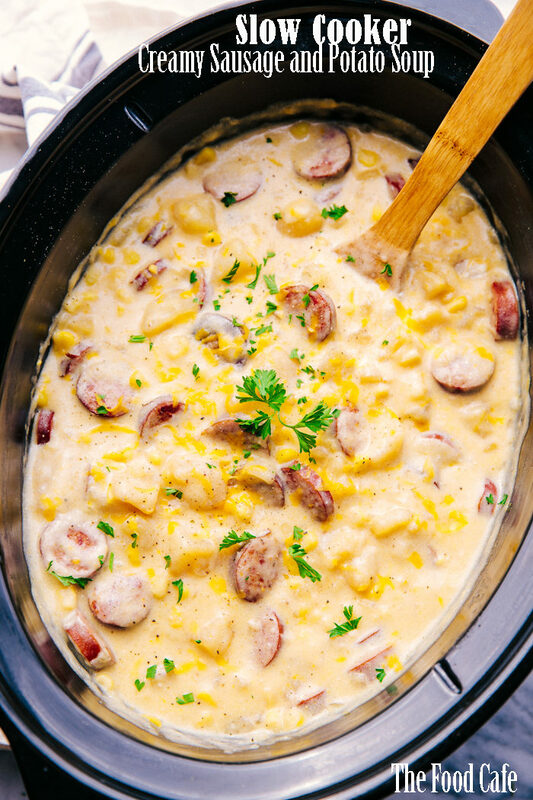 Slow Cooker Sausage and Potato Soup is filled with Andouille sausage, cubed potatoes, corn, and cheese, the perfect comfort meal for a weekend you can set and forget. In a 6qt slow cooker add ingredients through onion powder and cook on low for 6 hours. 30 minutes before soup is done, whisk together cornstarch and milk and pour into soup. Cover and finish cooking. Once done add grated cheese and sour cream. Stir to combine and allow a few minutes for cheese to melt. Serve hot with freshly cut parsley. If corn is fresh add in 1 hour before cooking time is done. If frozen add in with all the ingredients at the same time. When does the corn get added if it’s fresh corn? Thank you for your question. If you are using fresh corn add it in 1 hour before cooking time is complete. Wow this looks great! I just have one question. When adding the milk and Corn starch do you stir it after adding or just pour it in and leave it? Yes, stir it after you add it to mix it in! Ever make it on the stove? 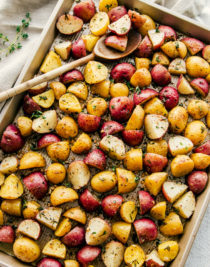 I haven’t made it on the stove, but if you cook the sausage and dice the potatoes and boil them for 5 minutes and then incorporate them into the recipe you could make it on the stove without the long cooking time. Let me know if you try it. Ive made it on the stove top tonight! Very easy. I put everything in at one (except the sausage) and put in on low for 1 hour and stirred it every 15 min. its awesome! That is awesome!! so happy you liked it, and good cooking option. What about can corn when can I add it, and can it be any sausage? You can use canned corn, I would add it 45 minutes before soup is done to warm it through. SO GOOD! Made a pot full several weeks ago and ready to make it again! Sharing on my blog tomorrow. Thank you so much for pinning. 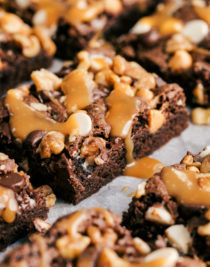 Making this tonight!!! Have you ever cooked on high?? Hi, no I have never cooked it on high before, but if you try it let me know how it turns out and how much faster it was! Made this tonight, and it got two thumbs up from the hubby! Delicious and full of flavor! I used Conecuh sausage, and it had just the right amount of heat. Adding to our rotation! 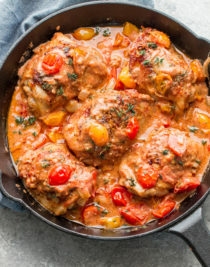 Is it possible to use heavy cream instead of the milk/cornstarch combo? Yes you can use heavy cream, it may not be as thick omitting the cornstarch, but it will still be creamy and delicious. 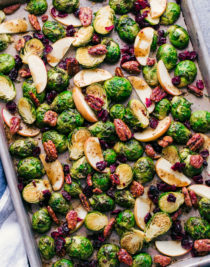 Can I make this on top of the stove? Thank you! Yes you can easily make it on the stove top in a large pot. Do you cook the sausage first or add it in raw? YES! Thank you so much for mentioning that!! Just cook them until slightly browned.